Leslie and Tyler prepping for an interview at the powwow grounds in Webequie. 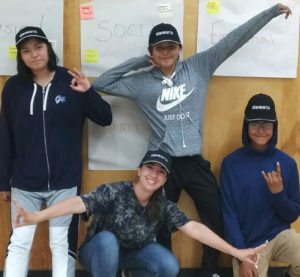 This summer, DAREarts was invited to partner with INAC’s Wellbeing Pilot Project initiative, where we journeyed to Webequie FN and Marten Falls FN as part of a team helping local youth to capture their perspective on community wellbeing through film. In this pilot project, the communities were asked to identify their priority areas of wellbeing, resulting in a focus on housing, health and education. DAREarts Associate National Program Director, Laura MacKinnon, joined this project as an education and community liaison, working with the youth documentary leads in each community and reconnecting with several other young people who had previously been involved in DAREarts along the way. In Marten Falls FN, Conrad interviews Chief Bruce Achneepineskum. Laura worked alongside a robust team that offered the youths in each community the chance to learn from industry professionals, including Chris Cornish of the Ring of Fire Secretariat, Melissa Courte of Indigenous Services Canada, Fraser McKeen of True Calling Canada, Morgan Inglis of Pink Buffalo Films, director PJ Marcellino of Long Year By Yen, Cinematographer Nika Belianina, and Sound Engineer Nicolas Field. Webequie youths Seequan, Kiara and Julian strike a pose with Laura during a DAREarts-led youth workshop on wellbeing and future visioning. 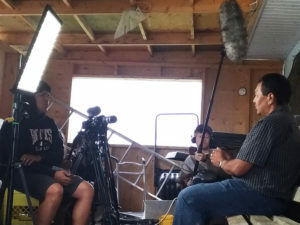 In Webequie FN, the team met with DAREarts alumni Leslie Spence and Tyler Shewaybick, who were eager to use their knowledge of documentary filmmaking as the leads in their community. Over 4 days, they shot community events, emotional interviews and brought 10 other budding young filmmakers into the project. 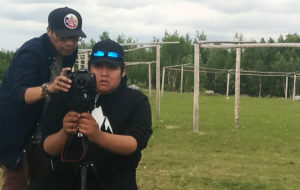 In Marten Falls FN, two more DAREarts alumni greeted the team, Conrad Baxter and Christian Peters, who worked quickly to shoot, schedule & film interviews and b-roll, involving 12 other youth. They asked the other youth their thoughts on their own definition of wellbeing, what they dream of for the future and what change they would like to see in their community. 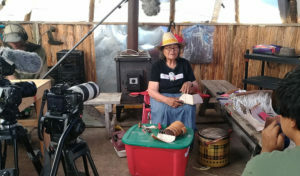 Under the guidance of the team and youth documentary leads, each community’s young people engaged in intergenerational conversations about wellness, recording interviews with parents, band council employees, knowledge keepers, and other youths. Conrad interviews elder Elizabeth Achneepineskum. This youth-focused pilot project will help guide decision-makers in government and beyond directly through the voices of each community, and serve as a model for successful community development. We are hopeful that this project will expand to more communities in the future, as this documentary is an opportunity for the youth to capture their voices as well as those of other community members on screen, learn a new skill, and showcase their story to a wider world.